The drills’ scenario involves joint flights with mixed Russian-Indian crews on Su-30SM aircrafts and Mi-35 and Mi-8 helicopters in the Voronezh and Astrakhan regions. The active phase of the Avia Indra-2014 joint air force exercises between Russia and India began today. Aerial manoeuvres are being held in Voronezh at the Pogonovo range and in Astrakhan Region at the Ashuluk training range, Colonel Igor Klimov, spokesman of Russia's Air Force, told journalists. Colonel General Viktor Bondarev, Commander-in-Chief of Russia's Air Force, attended a ceremony marking the start of the exercises in Lipetsk. 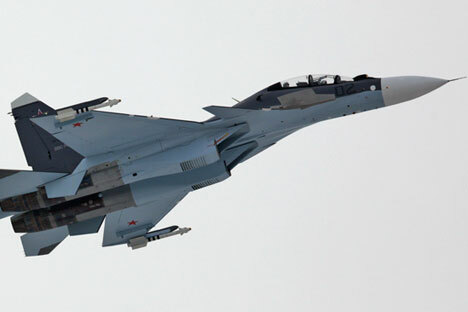 “Russo-Indian crews manning the aircraft Su-30SM, helicopters Mi-35 and Mi-8 are to make joint flights with firing at ground targets, and drill the refuelling of Su-30SM aircraft in mid-air by the tanker plane Il-78,” Klimov said. He pointed out that, beginning from August 25, Indian air pilots at the Lipetsk-based aviation centre studied the areas of the forthcoming flights and practiced piloting skills on modern training facilities, while air defence specialists have been familiarizing themselves with anti-aircraft missile systems at the training centre of anti-aircraft missile troops at Gatchina. “Joint air defence crews at Ashuluk military range will repulse a strike by a simulated enemy with field firings of anti-aircraft missile systems S-400, S-300, Buk-M1, and the Pantsir-S1 anti-aircraft missile-and-gun system.” The purpose of the exercises will be to train joint Russo-Indian crews in accomplishing various function tasks. The Indian Defence Ministry termed the exercises as a “major milestone” in military relations. “It will also provide an opportunity to both the forces for exchange of best practices and will cement the foundation for a more professional interaction and growth in the future,” the ministry added. Indra is a joint, bi-annual military exercise conducted by India and Russia that began in 2003. The exercise is tasked with boosting cooperation and interoperability between the Russian and Indian navies. It was later extended to the armies as well. In July 2014, Russia and India conducted the joint naval exercise off Vladivostok. The Indian fleet included the INS Ranvijay destroyer, the INS Shivalik frigate and INS Shakti fleet tanker. Russia deployed the Varyag guided-missile cruiser, the Admiral Vinogradov destroyer and the Peresvet large landing ship. This year marks the first time that the air forces are participating in the exercises. The Indian Air Force heavily relies on Russian fighter aircrafts and these exercises are seen as an opportunity for Indian airmen to familiarise themselves with the latest Russian technology. The Avia-Indra exercises will continue until September 5.